Waste Bin Capacity: 30 gal. Never waste time cleaning out a paper jam again. 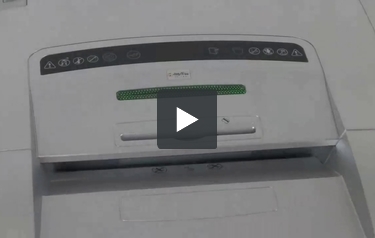 The Swingline LS32-30 features Jam Free technology in a large office strip-cut shredder. Ideal for heavy usage, the Swingline LS32-30 is a workhorse, providing consistently reliable shredding to your office environment with quality you need. The LS32-30 runs with whisper-quiet operation, self-oiling and is able to shreds CDs, paper clips, staples and credit cards. The strip-cut shred style of the LS32-30 provides a minimum security level 2, perfect for disposal of internal documents with non-sensitive information. Shred continuously during long jobs with the LS32-30 with the peace of mind you can only get from Swingline's Jam Free technology. The LS32-30 is able to shred up to 34 sheets at once into a huge 30 gallon pull out drawer and provides an auto shut down feature which conserves energy. Swingline offers a generous 2-year warranty on machine and lifetime on cutters with 2-years on-site service. The Swingline Strip Cut, Jam-Free LS3230 is the right choice for quality and value in a large office shredder. Perfect for common areas, this ultra-quiet shredder offers a variety of features designed to make shredding a breeze. The sheet capacity of the LS3230 is 32 sheets and the waste bin holds 30 gallons of shreds. It shreds CDs and credit cards in a separate slot. Non-stop, jam-free technology delivers hassle-free performance. The shredder stops and the indicator light glows red when too much paper is inserted. Simply remove the excess sheets until the indicator light turns green to continue shredding. The continuous duty operation lets you easily power through even the biggest jobs. Automatic oiling helps extend the life of your investment, and the Swingline LS3230 is durable, reliable and designed to withstand heavy long-term use. They're even eco-friendly by means of an energy saving power save mode with auto-wake up and paper bags for recycling. The LS3230 comes with a lifetime warranty on the cutting blades, a two-year warranty on the machines and two years of on-site warranty service is included. All these and more make the Swingline LS3230 a natural choice for your moderate security large office needs. If you're in the market for a new office paper shredder, you should take a look at the machines Swingline has to offer. The famed stapler manufacturer recently branched out into the shredder world and they're already making great machines. One of their models is the LS32-30, a large office shredder that may be just what you're looking for. Here's an outline of this machine's strengths and weaknesses. Check them out so you can determine if the LS32-30 is the right device for your office. The LS32-30 is perfect for departmental use. Not only does this machine has a continuous-duty motor, it operates quietly so you can use the shredder without disturbing your colleagues. Also, the waste bin has a 30-gallon capacity so it doesn't need to be emptied constantly. When you're ready to empty it, just pull it out and dispose of your shreds. This shredder can shut down automatically so it won't overheat. This feature will also help you conserve electricity which is good for the planet. The LS32-30 is self-cleaning and self-oiling which will help you save time on maintenance. Instead of oiling the shredder yourself, it will take care of it for you, so you can focus on more important things. This machine is really durable and will be able to help you out for a long time. The cutters are covered by a 2-year limited warranty; all other parts are covered for as long as you own the device. You also get to enjoy 2 years of on-site service. This is a strip-cut shredder that offers Level 2 security. Thus, this isn't the best machine for highly classified documents. It's much better for everyday shredding and can be used for junk mail, receipts, etc. The LS32-30's size makes it more suitable for larger offices. It measures 35" (height) x 21" (width) x 21" (depth) and weighs 147 pounds, so it's far from being a deskside shredder. The Swingline LS32-30 is a great paper shredder and it's perfect for busy offices so long as they have the room for a large machine. This device has a first-rate shredding capacity and its ability to shred non-paper items is definitely impressive. The continuous-duty motor and large waste bin ensure that this machine will be able to withstand heavy daily use. Also, the automatic shut-off and self-oiling features are very convenient and will help you save time and energy. However, you'll want to consider the LS32-30's security rating and determine if it's right for your needs. If you decide it is, you're going to love this shredder. Good luck and happy shredding! Entry Width 10" 10" 10"
Shred Size 1/4" 1/8" x 1/2" 5/32" x 1 1/2"